Parathyroid surgery can be tricky which is why all your doctors will tell you "get the most experienced parathyroid surgeon you can" or you can have a failed parathyroid surgery or a bad complication. The fact that we have a business that is exclusively parathyroid surgery is evidence that this is not always a simple operation. If parathyroid surgery were simple, and if every town had an expert, then there would be no need for the Norman Parathyroid Center. Nobody would need to travel to Tampa for their parathyroid operation and we would quickly go out of business. The fact that 18% of our patients have had one (or more) failed parathyroid operations prior to coming to see us is evidence that parathyroid surgery can be tricky. Almost 40% of the operations I perform as the senior surgeon are on people who have had failed, unsuccessful parathyroid surgery previously. Yesterday 3 of the 10 parathyroid operations on our schedule (I was operating with Dr Politz yesterday-all of our patients get two expert surgeons and zero doctors in training) had an unsuccessful operation. Let's look at two of these three cases and discuss what went wrong, and what can be done. These three people had a total of 7 previous parathyroid operations. The third case will be a separate blog, one of the saddest cases I have ever seen. Unsuccessful Parathyroid Surgery Case #1: 45 Year Old Teacher; Boston, Massachusetts. 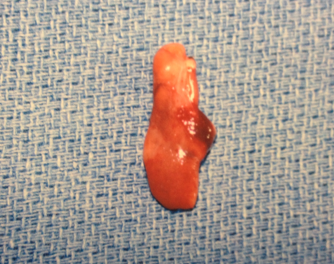 Maggie's case is the simplest of the three failed parathyroid surgeries we saw yesterday. She had classic high calcium and high PTH levels. Her biggest complaint was terrible fatigue. She even had to take half a year off of teaching because she felt so bad and was tired all the time. Her calcium levels ranged between 10.2 and 11.1 mg/dl. She had low vitamin D (virtually 100% of patients with a parathyroid tumor have low vitamin D!). Her PTH was 88 to 105. Any first grade student of hers should be able to diagnose this classic case of primary hyperparathyroidism. The problem started when her surgeon at MGH got a sestamibi scan which was positive, showing a left lower parathyroid tumor. The surgeon operated, planning on a one-side operation (which we never do-did you see our video?) to remove the tumor that shows on the scan. He operated and removed the left lower parathyroid gland, measured her parathyroid hormone (PTH) in the operating room and it fell by 56% so he was confident he had cured her and the operation was concluded. Of course, 2 days later it was discovered that Maggie's calcium and PTH were both still elevated. The pathology showed the removed left lower parathyroid gland was a normal parathyroid gland. She saw the parathyroid surgeon again 2 weeks later and he obtained another sestamibi scan which showed the same left lower parathyroid tumor. So, 3 days later she is back in the operating room in Boston and the same surgeon (who also does breast cancer surgery and stomach stapling for morbid obesity) operated on the left side of her neck again. This time the parathyroid surgery took 3.5 hours and he couldn't find the tumor, so he took out the thyroid gland on that side of the neck. (see bottom of page for a link to our publication 2 years ago on 1100 re-operations that we did and see that over 70% of the time surgeons take out a thyroid gland when they can't find a parathyroid tumor-something we have never done). Of course you know the answer-she wasn't cured. The tumor was not "inside" the thyroid and she didn't need her thyroid removed. Maggie's deep left upper parathyroid adenoma. Removed within 7 minutes of starting the operation. There is nothing more important than experience when dealing with failed parathyroid surgery. When we consulted on her we knew immediately the mistake that was made. The sestamibi scan was correct in showing the tumor, but it was interpreted incorrectly. The scan did NOT show a left lower parathyroid adenoma; it showed a large left UPPER parathyroid adenoma that was deep in the neck. One of the things I would change if I could turn back time a few hundred years is the naming of parathyroid glands. First, I wouldn't call them "parathyroid glands", I would give them a different name that wasn't confused with the thyroid. But, back to the point at hand, I would see that they were called "Deep" and "Superficial" instead of "Upper" and "Lower". Maggie had a deep left upper parathyroid tumor that her surgeon didn't realize was deep and he operated on her in a surgical plane that was too superficial. Her large parathyroid tumor was a deep upper and not a superficial lower. We tell people this every day- be careful of your scans! Even when positive sestamibi scans are wrong more than they are right. This scan was correct-it was the humans (radiologist and surgeon) that were not experienced enough to recognize the difference. We say this every day-stop getting scans, they are wrong more than they are right, even when they show a tumor! Maggie's operation with us took 17 minutes. From the time the operation started her large parathyroid tumor was out being photographed in just under 7 minutes. We then went to the right side of her neck to check the other two parathyroid glands (that still had never been checked). These two glands were perfect and dormant (making near zero PTH). The operation was concluded and she went home cured about 55 minutes later. Failed Parathyroid Surgery #2. 51 Year Old Woman From Ann Arbor, Michigan. Susan had two parathyroid operations earlier this year, one day apart. Her surgeon operated on one side of her neck (the left side) because her CT scan and sestamibi scan said "highly suggestive of left side parathyroid adenoma". The first day he operated on her, found both left side parathyroid glands, took the bigger of the two out and closed. He obtained a parathyroid hormone (PTH) level in the operating room to see if the PTH would fall by 50%, and if it did he was confident that she would be cured. Folks, we do NOT use intra-operative PTH monitoring because it does not work. Experts look at all four parathyroid glands, non-experts look at one, take it out, measure PTH, and then quit. Virtually every patient that we operate on (2-3 per day) had a surgeon use PTH monitoring in the operating room INSTEAD of looking at all four parathyroid glands. If measuring PTH in the operating room worked, we would do it! And if measuring PTH in the operating room could tell when a patient was cured, then we would be out of business and I wouldn't be writing this blog. Susan's first operation took 1 hour, 45 minutes. The surgeon wasn't sure that he cured her even though the PTH fell by 68% (even this surgeon knows it doesn't work but he used it anyway!). So he kept Susan in the hospital overnight so he could measure her calcium and PTH levels every few hours to see if they would decrease. Of course they did not, so he operated on her again the next day. This time, he operated for 6.5 hours. Remember the scan was read as probably parathyroid tumor on the left side. So, he operated on the left side for 1.5 hours and found nothing… he then went to the right side and found the normal right upper gland but could not find the right lower gland. He went back to the left side for another 4.5 hours and "cleaned everything out that he could find". 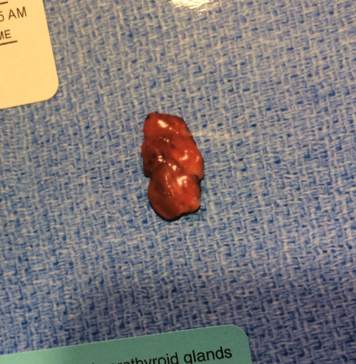 This included another normal parathyroid gland and the entire left side of her thyroid. Susan's classic right lower parathyroid adenoma. Susan spent that night and two more in the hospital She couldn't talk because her vocal cord nerve was damaged. They had already been on parathyroid.com and knew this wasn't the way it was supposed to be done. Susan's husband called us from her hospital room and made arrangements for her to come to Tampa for her third parathyroid operation. They were tired of the "expertise" they had in Ann Arbor. Yesterday marked 10 months since Susan's two operations. Our sestamibi scan found her right lower parathyroid tumor within 5 minutes of scanning. Of course we knew it had to be on the right side because both normal glands on the left were previously removed. Her operation took me and Doug about 14 minutes total time. She went home 30 minutes later. She had a classic, routine, right lower parathyroid adenoma located within the tongue of the thymus-right where parathyroid adenomas are supposed to be. Don't Fall for the Expert Parathyroid Surgeon Hype. We understand that everybody in the world can't come to Tampa for their operation. But be careful of surgeons (and endocrinologists!) who put too much emphasis on scans. Sestamibi scans, CT scans, 4-D CT scans, MRI, Ultrasound, etc, etc, are not accurate enough to allow surgeons to operate and remove one gland and then stop the operation if the parathyroid hormone measurement decreases by 50%. This may be the only surgeon that you have available to you, but talk to them honestly about what happens if the PTH doesn't drop. And what happens if the PTH drops but you still have hyperparathyroidism 2 months later? This happens in every hospital every week. Surgeons say they are experts because they have a positive scan and have a PTH assay they can use in the operating room. Be careful folks. Talk long and hard with your surgeons. Make sure they give you the right answers. Hold them accountable. Demand the best, and don't be afraid to seek a second opinion. If parathyroid surgery was easy, we wouldn't have a practice dedicated to JUST parathyroid surgery. If there was an expert parathyroid surgeon in every town, nobody would come to Tampa. Be smart, and take care of each other! Demand the best from your doctors-they work for YOU! Check out our map to see where our patients come from. We have operated on a neighbor of yours! Watch the video of a 4-gland parathyroid operation through a 1 inch incision that takes less than 13 minutes. This is the 4-gland operation that all our patients get. About 90% of the failed parathyroid surgery patients that we operate on had a surgeon that "cheated" during the operation. Read our blog on how to tell if your surgeon is cheating. Key words: failed parathyroid surgery, failed parathyroid operation, failed parathyroidectomy, unsuccessful parathyroid surgery, unsuccessful parathyroidectomy.